← Trinity Blood- Halfway Into The Series. It’s sad that I have to sit there and see all these characters/people hating on Vash and mistreat him based on things they hear and not what they see. I didn’t expect him to value life so much that even when others beat him up, shoot at him, he doesn’t point a gun at them-if he does, it’s just a bluff- but instead tries to reason it out. He prefers thee method of solving problems using words. Generally, he’s always seen smiling and laughing but those are probably empty smiles and empty laughs with a few special occasions where he’d smile wholeheartedly. He’s a good person but his ditzyness [if it’s even a word] is hard to put up with. It always has me asking ‘why? why don’t you just shoot?’. I get so frustrated with him at times. 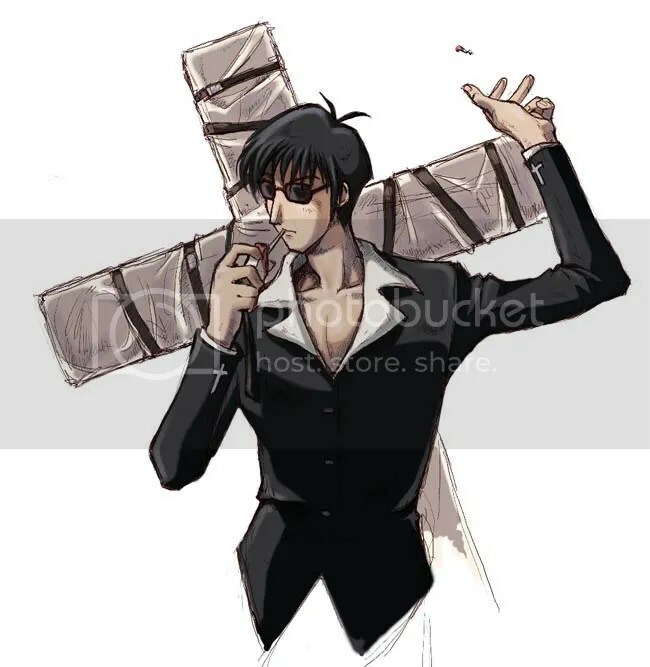 Wolfwood, ahh, he was such a cool character until I found out his true intentions for approaching Vash. I won’t spoil it but it was such a shock that I just couldn’t accept it. 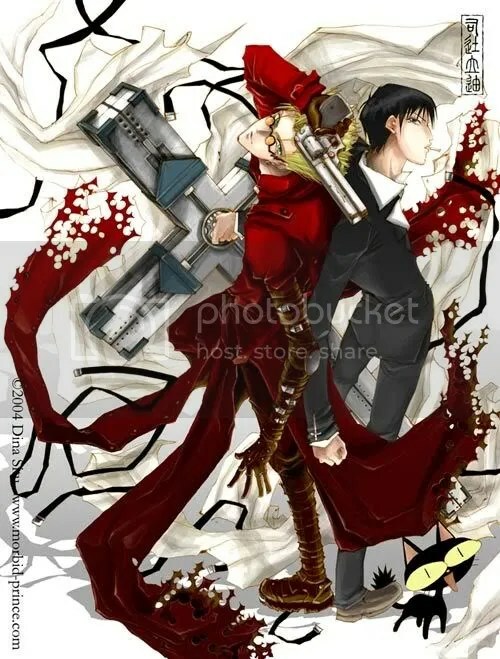 I wonder if Vash knew about Wolfwood’s true intentions. He had an accent. :P But for those who have already watched this, was his [death and being a Gun-Ho Guns] a shock? and, and, he has such a cool weapon. o3o it’s so awesome. I didn’t think it’d be a weapon but I was surprised when he took off the cloth. I didn’t really like the ending, at least there should have been a scene showing the main cast going about in their lives so we can get a vague image of what their goal is now that Vash’s big moment is over. I liked the song that was Rem’s favorite. It was nice. Sound Life is what I think it was called. Some of the things in Trigun like the seeds, plant energy, space ships, new life, all of that stuff, I couldn’t completely understand it. I got some of the basics down but it was hard to grasp a hold of because it just didn’t make sense to me. heh. What I liked most about Trigun was Vash’s sheer determination to uphold and abide by his beliefs even if it meant costing his life but he would put aside those beliefs if another person was in danger. The whole ‘not taking another person’s life’ idea kept coming up over and over and was completely etched into my mind. The show made it completely clear that it was important part to the show and to Vash. The situations that were set up to put forth the idea were nicely executed. I seriously think that I like every series that I’ve watched and there aren’t many that I consider bad let alone horrible. This entry was posted in Anime, Finished, Trigun and tagged action, anime, comedy, Humanoid Typhoon, Vash the Stampede. Bookmark the permalink. So basically you are a graphics whore ? yeah, i guess i am if you put it that way. is there something wrong with it? what’s wrong with liking anime with more vivid and clear graphics? besides, if i was really a ‘graphics whore’, i wouldn’t have watched Trigun and all of Sailor Moon or even attempt to watch Cowboy Bebop, right? I love trigun! 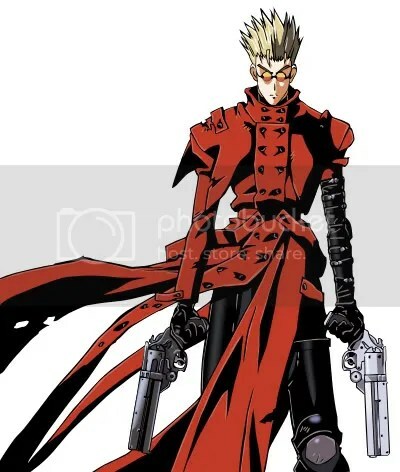 even thou I have only seen it in dubbed form… Vash’s personality is awesome and so funny to watch him, probably one of the funniest male characters I have ever seen in recent anime.